(Reuters) - Corona beer maker Constellation Brands <STZ.N> will infuse another $4 billion into Canada's top cannabis producer Canopy Growth <WEED.TO>, the biggest investment in the industry, to capitalize on booming demand for marijuana. Constellation, among the first big alcohol makers to invest in the marijuana industry, pumped almost $200 million in Canopy last year in a deal to produce a non-alcoholic cannabis-based beverage. With the new investment it will support Canopy's full suite of products and assist as it develops new offerings, Constellation Chief Executive Rob Sands said on a conference call. Toronto-listed Canopy shares rose as much as 35 percent and were up 28 percent at C$41.17 at 10:18 am ET (1418 GMT), the highest level since June, and lifted shares of its peers. Constellation shares slid 8 percent to $203.73 in New York. Canopy said it will use the proceeds to expand and gain exposure to the nearly 30 countries likely to approve medical marijuana. It is targeting C$1 billion in overseas acquisitions over the next six to 12 months, Canopy Chief Executive Bruce Linton said on the call. "This (deal) marks the end of the warm-up in our sector ... It's fully go-time," Linton said. Canada, where 4.4 million people reported using marijuana in the first half of the year, approved medical marijuana in 2001 and will fully legalize the recreational use of cannabis in October. As some countries start opening up to legalizing medicinal marijuana, Constellation peers Molson Coors <TAP.N> and Anheuser-Busch <ABI.BR> have also pursued cannabis deals. Molson Coors said this month its Canadian arm would make cannabis-infused drinks with Hydropothecary Corp <HEXO.TO>. With its new deal, Constellation is paying a 38 percent premium to Canopy's five-day average price, taking its ownership in the company to 38 percent. "While STZ (Constellation) is paying a rich premium ... we believe this was the right move and further solidifies STZ's first-mover advantage ...," Bonnie Herzog, a senior analyst at Wells Fargo, said in a note. Constellation's shares had gained 11.7 percent over the past year before the announcement, underperforming the S&P 500 index. Canopy's share price has almost tripled. 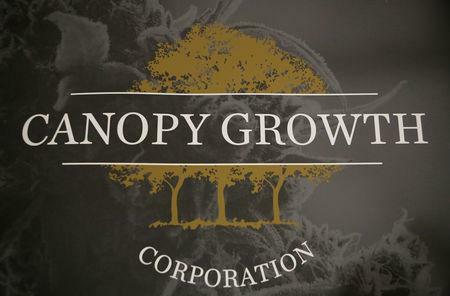 Canopy is Canada's biggest cannabis firm, with a market capitalization of C$8.9 billion ($6.76 billion). Five of the biggest Canadian producers are now worth a total of over C$18 billion, despite low sales and almost non-existent profits, as they pour capital into increasing capacity. Recreational use is allowed in nine U.S. states and the District of Columbia, and sales in U.S. legal markets should nearly triple to $16 billion by 2020 from $5.4 billion in 2015, according to Euromonitor International. Constellation said neither company plans to sell cannabis products in the United States until it is allowed to do so at all government levels. Canopy's revenue rose 63 percent to C$25.9 million in the three months ended June 30 from a year earlier. Cannabis sales volumes climbed 47 percent, while the average sale price was up 12 percent, driven by increased sales of medical marijuana in Germany, Linton said. The deal lifted shares of Aurora Cannabis <ACB.TO> and Aphria Inc <APH.TO>, which rose 21 percent and 17 percent respectively. The ETFMG Alternative Harvest ETF, which includes U.S.- and Canadian-listed marijuana producers, rose 6.4 percent.